What's the Score with the Huntington Park Scoreboard? What’s the Score with the Huntington Park Scoreboard? 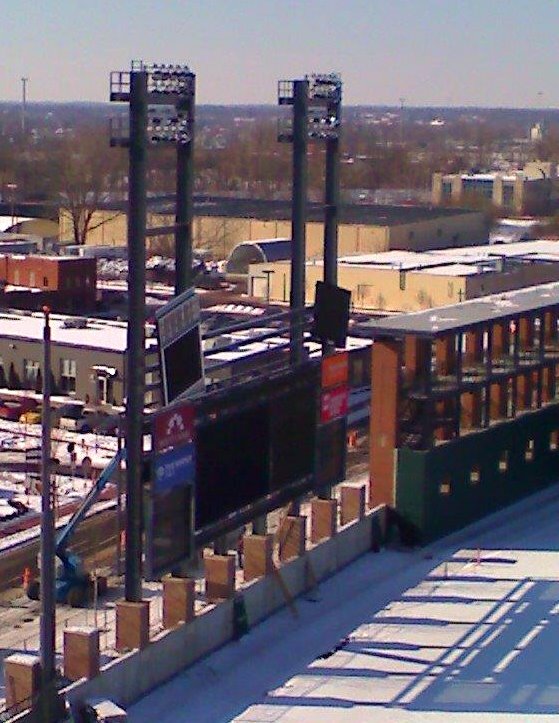 On Saturday, January 14th, two DāNite Sign Co. crane crews worked together to remove the “The Columbus Dispatch” letters from Huntington Park’s iconic scoreboard. DāNite Sign Co. originally engineered, built, and installed the Dispatch sign for the Grand Opening in 2009 for what has become the No. 1 ranked ballpark. As the 12′ tall “D” was hoisted over the scoreboard and lowered to street level on Neil Avenue it was a bittersweet moment of nostalgia-meets-progress. After 8 seasons, it’s hard to imagine what might fill the empty void this year. 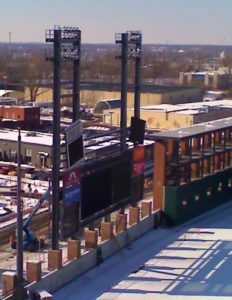 But the Columbus Clippers’s scoreboard won’t stand empty for long, and the DāNite Sign Co. team has assisted in the planned replacement. 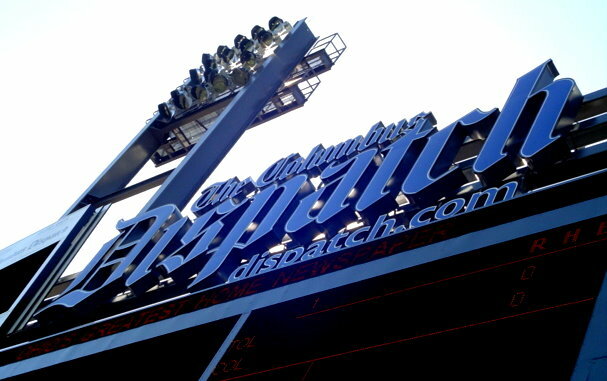 As recently reported in a Columbus Business First article titled “Dispatch sign comes down at Huntington Park after sponsorship pullback“, Clippers President Ken Schnacke stated, “WBNS-TV and radio affiliate 97.1 The Fan, still owned by the Wolfe family that sold the Dispatch, will take over the $6 million, 20-year sponsorship” of the scoreboard. Naturally, with change in sponsorship comes change in signage. Through collaboration with the new sponsors, DāNite Sign Co. designer Thad King and Project Manager Michael Cox, Sr. have produced a creative solution to the challenge of integrating the existing scoreboard and message centers with the branding of the new sponsorship. 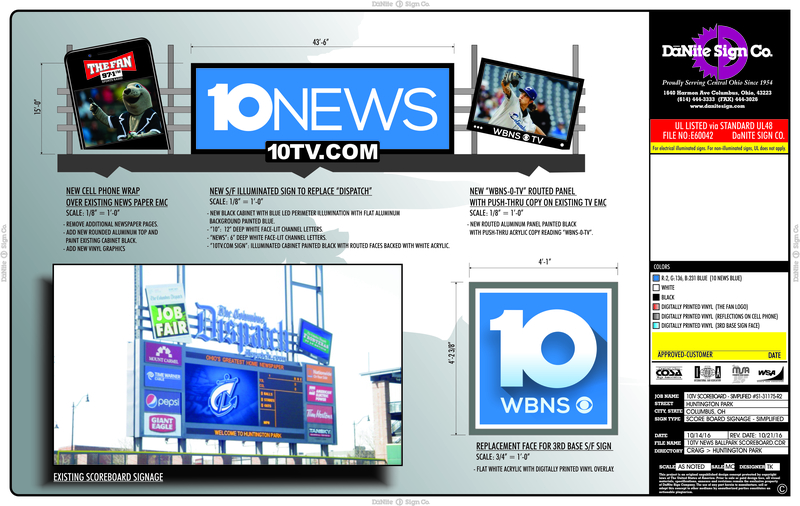 Sometime in March of 2017, the DāNite Sign Co. cranes will return to install a 15’ tall by 43′ 6″ long 1oTV “10NEWS” sign cabinet in the dominant sponsor position. The existing left side electronic message center had previously represented the changing body of a “newspaper”. It will now, in a fitting technology upgrade, become a “cell phone” with The Fan’s logo emblazoned above a changing cell phone screen. The existing right side message center will have a routed aluminum panel added to the bottom, altering it to resemble a”Computer Monitor” with the WBNS TV logo, representing their online news product. As always, DāNite Sign Co. is grateful to be a driving force in the creation of an iconic signage landscape in Central Ohio, and proud to offer innovative solutions for the challenges that progress can create.